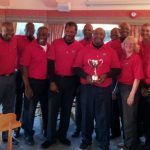 The 2019 season kicked off with 32 members and guests competing at a new Venue for the CGS, Willesley Park GC in Leicester was the host for the Fix-Up Cup. Willesley Park GC located in Ashby-de-la-Zouch is one of those old established venues. Laid out in existing mature parkland in 1920, Willesley Park is home to the annual Leicestershire Fox and has long been recognised as one of Leicestershire’s leading courses. In spite of the heavy rains that had fallen on the course the night before the course was in very good condition, the only negative would be the greens weren’t the best, some of the greens looked to have suffered from some disease so were patchy in places which resulted in many a three putt due to their bumpy nature. It must have been the location but compared to other parts of the Midlands it was very cold on the day and at times we were subjected to everything the elements could expose us to apart from snow, we went through hale, rain, wind and sunshine, the conditions played a big part and would test all in attendance. Amongst the 32 players were five guests, some returning having played in previous events some new to the CGS. They were Neville Fennell, Karl Frail, Errol Murray and Tony Blackwood. With the difficult conditions the wind was the stalwart of the day, consistently playing a major part in shot decision making. Scoring was tough and along with numerous blind tee shots on a course very few have played before it was a challenge and a real test of our abilities. It was a tough day for Keith Riley returning back to the CGS after several months out with injury, glad to see you back Keith. Keith’s wife Mary was still unable to play still recovering from hip surgery but will be back on the course soon. With the majority of the 32 man field struggling to score above 30 points only 11 players were able to crack the 30 point mark, the winning score of 38 points was a tremendous number taking into account the elements in opposition. It can only be said that Paul Ramsey’s score of 38 points was well deserved. His driving on the day was second to none if we had to count the number of fairways hit it must be around the 90 percent mark, he didn’t miss many. His putting was also another strong point of his game, if all the birdie putts hadn’t grazed the hole he would have scored even higher. He said that throughout the winter he’d basically gone back to basics and it’s been working and it showed in the result. Sometimes we can go so deep into trying to find the secret to this game that we can make it more complicated than it is. An example of simplicity and a non-complicated swing would be a small child who has no idea about the physics of a golf swing but can just hit the ball straight without any complicated thought going through their mind, it’s only has we grow older that we can add more and more baggage to something so simple and that can be said for life too. The phrase “KISS” comes to mind, google it if you don’t know it! 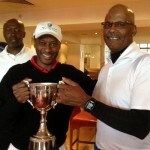 So congratulations Paul Ramsey solid simple golf rewarded with the Fix-Up Cup. Runner up with 34 points was Roan McLeod and 3rd went to Ludlow Stuart with 33 points. 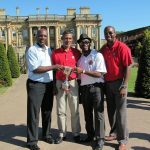 Amongst the other winners on the day were Ronald Ross for his shot on the nearest the pin hole, his shot was difficult to follow when viewed from the tee. The longest drive, the longest drive, what can we say about the longest drive….., maybe we should just rename it “Higgins drive in”, once again Ian Higgins picked up the longest drive prize, I think we should make him drive left handed…hmmm that’s an idea! The last hope for all was on the 18th with the nearest the pin in two, it would eventually be won by Ludlow Stuart. We are now in our 12th season and the CGS continues to improve and grow and having helped to set those foundations two of the founding members Denny Senior and Roan McLeod have both decided to step down from their roles as Secretary and Handicap Secretary. Denny who was the CGS’s Secretary as now handed on the mantel to Chris Powell whom has brought in new methods and energy to organising proceedings and the fruits of his labour has already been shown in the attendance for this the first event of the season! Along with Denny, Roan McLeod also stood down from his role as Handicap Secretary passing that mantel onto Keith Salmon who as stepped up and volunteered to fulfil those duties. He’s had to learn how to use the Handicap Master software we use to manage the events, he’s also had to experience the other side in dealing with issues on the day from players, it all goes with processing the final results. Both Chris and Keith have started well. 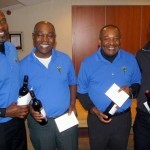 The success of this event showed their commitment to the growth of the CGS going forward. So the first event is now complete, thanks to all the winners and to all those who attended. A big thanks to Willesley Park Golf Club whom have been very accommodating, this venue has been on the CGS radar for many years but we just couldn’t get a tee time that would work for both parties. On this occasion Willesley has stepped up and offered the CGS a good package, it’s just a shame about the weather but hey it was much worse the year before. The club have also offered the CGS a four ball at a generous rate just because we’ve never played the course before and experienced many blind tee shots without the aid of a course guide which weren’t available in the pro-shop. So thanks to Willesley I’m sure that offer will be taken up by some of our members. Another big thanks goes to the catering staff, the service was well received by our members and so was the meal. This is a venue which was well received by our members and one which will hopefully be on the schedule for next season. 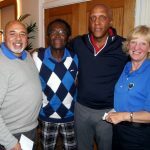 Next event will be “Telford Hotel & Golf Resort”, where those in attendance will be competing for the Captains Trophy.